I just started my new job working at The Home Depot, which quite a departure from the computer field where I’ve spent most of my working life. Out of all the places where I applied for work since losing my job 3 months ago, Home Depot was the only employer who responded to my application and set me up for interviews at three of its stores in my area. The first two stores turned me down but it was the third one that offered me a job on the spot. And here I am, once again working. I work as a lot associate, which involves roaming the parking lot and bringing in shopping carts. On my first day in the lot, I noticed I did quite a bit of walking and became curious about the distance I walk during my shift. The next morning I came to work with a pedometer clipped to my belt to count the steps taken throughout the day. 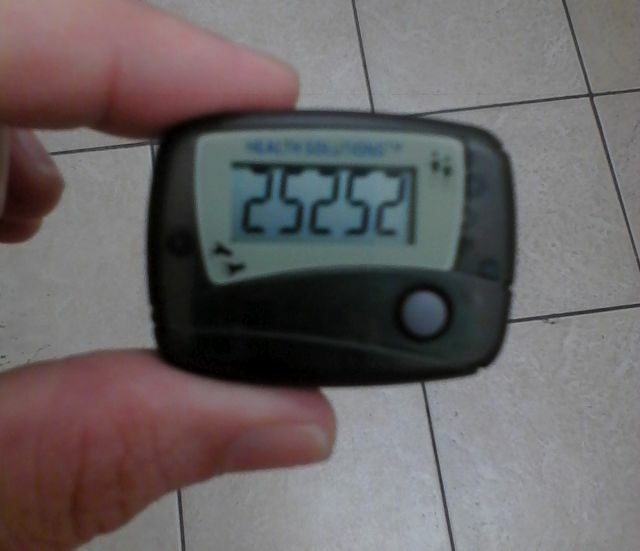 When it came time to clock out 6 hours later, I removed the pedometer to record its final reading. Yes, in 6 hours I had taken 25,252 steps. Then I became curious about how to convert this number to miles. After I got home from work, I did a quick search and came across this site with the converter I’d been looking for. It reported that 25,252 steps is equivalent to 12.63 miles or 14.24 kilometers. That feels about right. So far, so good with the new job. I get lots of exercise, spend hours in the sun and meet some very nice people, both customers and co-workers. I think I’ll stay here awhile. ← One fine afternoon at the bar.